If you’re wondering how to find a great RGB fan for your PC, you’re in the right place. The biggest thing to keep in mind is that they’re designed to both look awesome and keep your PC working effectively by keeping the operating temperature cool. We researched some of the most buzzed about products out there and put together this guide to help you find the right one for you. Here are some of the key things to keep in mind. Pieces: This number tells you how many fans are included with the kit. We found some that have 3 and others that have as many as 6. We even found a kit that includes LCD light strips, too. 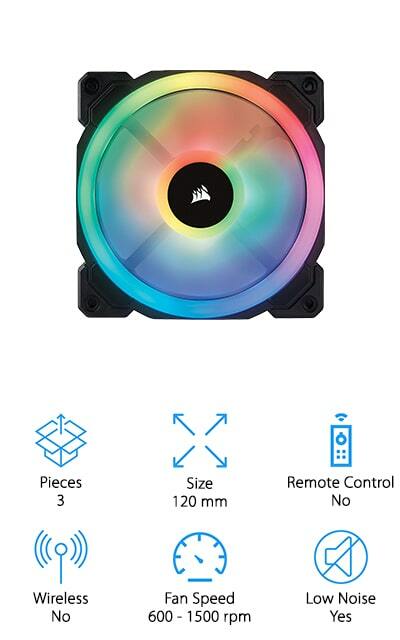 Size: All of these fans are 120mm, the standard size for RGB fans. That’s a good thing because it means they’re compatible with most PCs. We should mention that this doesn’t mean that all the fans are compatible with one another. Remote Control: Some of these fans use a remote control that you can use to do just about anything. Not only can you turn the fans off and on, but you can also cycle between colors, lighting effects, and speeds. Wireless: Some of these fans are wireless while others are controlled with software so you actually have to make changes on your PC or us a control that’s in line with the wires for the fans. Wireless fans are definitely more convenient. Fan Speed: As we mentioned, these also have to be functional. Fan speed is measured in rpm which is important because this is how they keep your computer cool. The faster the rpm, the more air the fan moves. Low Noise: The last thing you want is a super loud fan to distract you from your work, games, or conversation. Luckily, most of these fans are rated less than 30 decibels so you shouldn’t have a problem. Now that you know a little more about them, let’s take a look at our RGB PC fan guide. If you’re in a hurry, start right at the top of our list. That’s where you’ll find out top and budget picks which is the best way to see the range that’s available. There are a long of great kits here, though, so stick around as long as you can. What’s the best RGB fan? Let’s get started and find out. Our top pick just happens to be one of the best 120mm RGB fans out there, the Corsair LL Series RGB Fan. 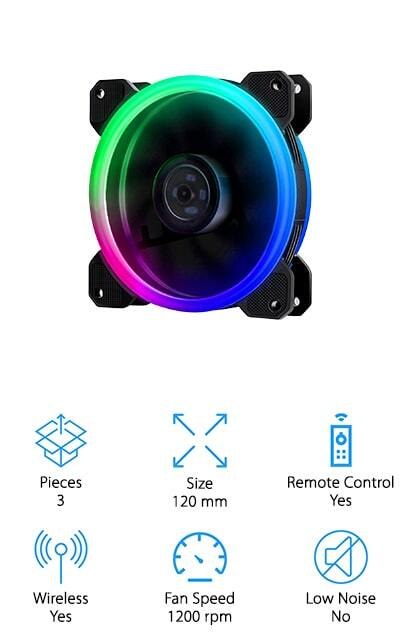 With 16 independent RGB LEDs in each fan spread across 2 different loops, you create a variety of bright, vibrant visual effects. Corsair Node Pro is also included to provide software control and easy customization. If you want even more variety, other Corsair products, including additional fans and LED lighting strips, are also supported. These fans are practical, too. With varying 600 to 1500 rpm, you can maximize airflow to keep your computer operating temperature cool. That’s important to get the best possible performance and extend the life of your PC. That’s not all, this fan was also designed for quiet operation so it won’t distract you from your work. 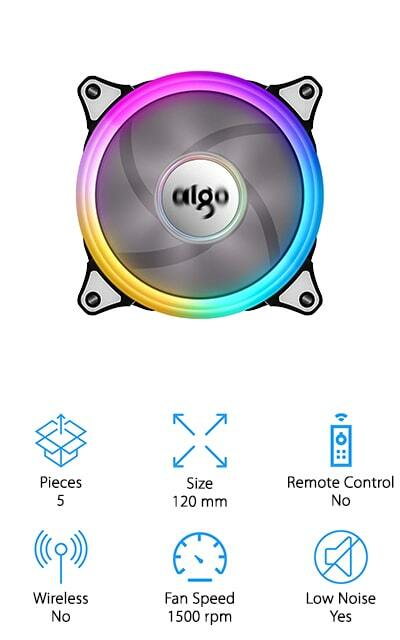 One of the best RGB fans for radiators available is up next, the Aigo Aurora C5 Kit Case Fan. One of the most noticeable things about this kit is how quietly the fans run. Each features a hydraulic bearing that self-lubricates, practically eliminating friction which decreases noise and makes each fan more efficient. Plus, they spin at 1500 rpm which creates adequate airflow for effective cooling. There are 7 different colors and 7 different modes to choose from, including various color shift settings, a single color spin, and random color rotation. While there’s no remote control, cycling between settings is really easy using the small 3-button control panel. The fans are 120mm, the most common size for computer cases and radiators. That’s not all, this kit is also covered by a 1-year warranty. EZDIY-FEB RGB Case Fans are some of the best fans for PC modding. 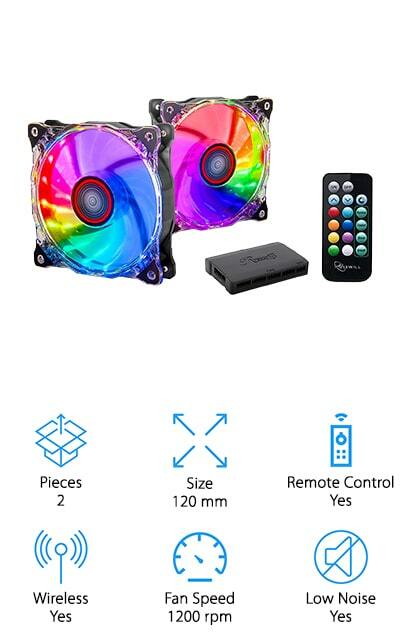 This set comes with 3 fans but you can them up in with as many as 6 altogether and an additional 2 sets of RGB lights. Color change between different sets synchronizes effortlessly and there’s even intelligent color match for a seamless look. If you’re looking for a kit you can eventually upgrade, this is a great choice. With a speed of 1200 rpm, these fans are effective at keeping the temperature down and remarkably quiet. The motor features hydraulic bearing technology that not only keeps the sound down but also runs so effectively that it has a 20,000-hour lifespan. Color options are unlimited and the remote control lets you cycle between static, flash, and fade mode from across the room. 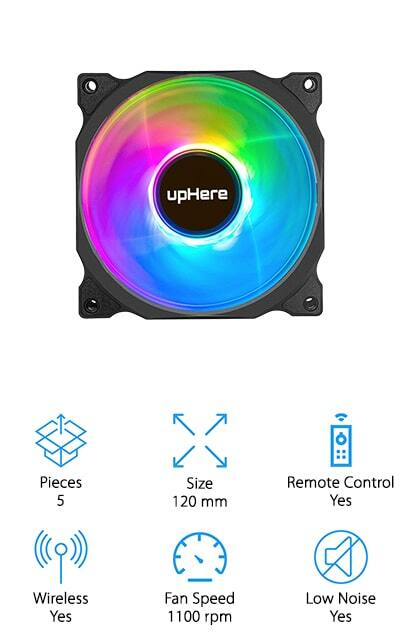 The next item on our list is the upHere RGB Case Fan. It features unlimited color transformation and so many modes that you’ll have a hard time deciding which one you like the best. Plus, you can change between colors, change the speed, and cycle between effects modes quickly and easily using the remote control board. In addition to looking awesome, these fans are also effective. The 1100 rpm created enough airflow to cool your PC plus they come with an oil capsule so you get the necessary lubrication without having to worry about leaks. These fans can operate for as long as 40,000 hours. They’re quiet, too, in part because of the anti-vibration mounting system. In-mold injection rubber pads even protect the corners for maximum coverage. This set also includes all the installation screws you need. The simple styling of the DEEPCOOL RF120 RGB Fan makes this set one of the best looking RGB fans available. 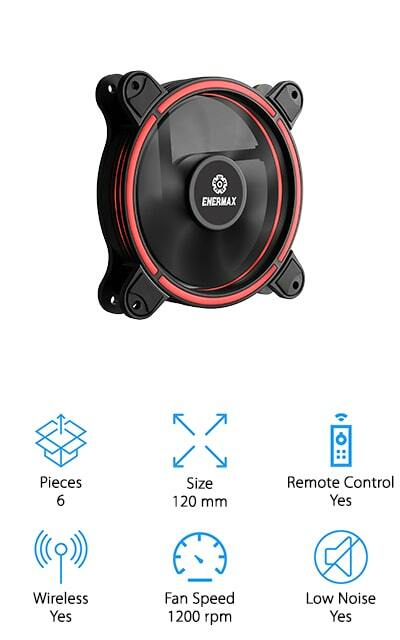 With a variable fan speed of 500 to 1500 rpm, this set provides enough airflow to keep the operating temperature cool while being barely louder than a whisper. Plus, you can add 3 more fans if you want to expand the system. There are 7 different bright colors available and 3 different lighting modes to choose from: breathing, static, and multi-color cycling. There are 2 options for controlling it, too. You can use the built-in cable controller or the included SYNC motherboard software. That’s not all, there’s also a pretty great warranty that covers the product for 3 years as well as any damage it may cause inside your PC. 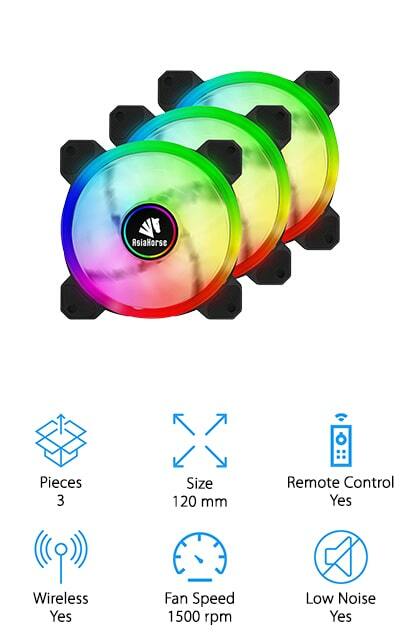 Another great pick for best RGB computer fans is this set, the Asiahorse UFOII RGB Fans. 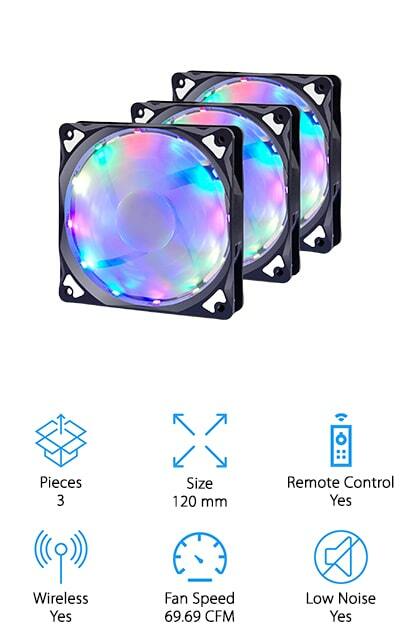 This set includes 3 fans but you can add 3 more as well as 2 sets of RGB lights for an upgraded experience with synchronized color change, intelligent color matching. With unlimited color transformation and more than 100 light modes, you really can create a one-of-a-kind look. That’s not all, the LED lights are controlled separately for impressive coverage and variety. An easy to use remote control lets you make adjustments at the touch of a button from across the room. In addition to looking awesome, these fans also have high airflow which makes them capable of large volume cooling for cooler PC performance. Hydraulic bearing technology ensures smooth operation for an operating life of about 30,000 hours. Not only does this LEDdess kit include 3 RGB fans, but you also get 2 LED strips so you have a lot of options for customization. That’s not all, it comes with a control box that can support up to 7 additional fans so you can expand the system pretty easily. The remote control allows you to adjust everything. Choose different colors, turn auto-color changing off and on and change the speed at which they change, adjust the brightness, or choose a static color. In addition to looking great, the fans also have a speed of between 1000 and 1300 rpm for high-airflow and large volume cooling. They operate quietly and effectively to keep your PC operating efficiently. One more thing, you can also adjust fan speed right from the remote control. Next up is the OxyLED RGB PC Case Fans, a great set that not only looks great but is also effective enough to keep your PC cool and running smoothly. In fact, they cool at a rate of about 70 CFM. Plus, they’re whisper-quiet and won’t distract you from your work or interfere with conversation. 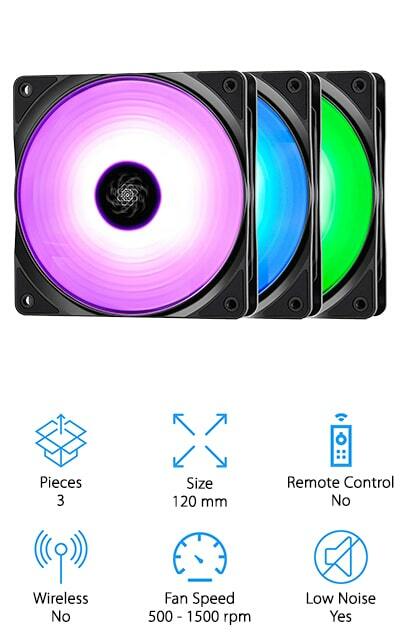 These fans feature LED lights that cycle between 7 different colors. That’s not all, you can also choose between 6 light modes, 6 flashing speeds, and 6 different brightness settings. Everything can be adjusted using the compact remote control including 6 different preset modes. Installation is really easy, too. All of the necessary screws are included. The only other things you need are a magnet and some tape and you’re good to go. Our last pick for best RGB case fans is the Enermax T.B. 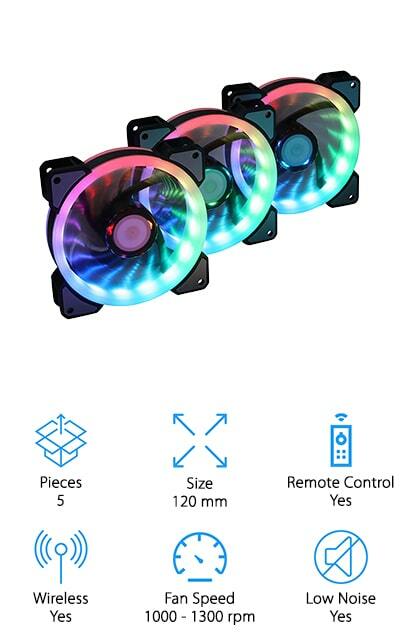 RGB Case Fans. They feature a unique halo shape design that creates a gorgeous visual effect that provides consistent and uniform brightness. This is a good choice if you’re looking for something you can eventually upgrade, too. The control box supports up to 8 RGB fans and 2 LED devices so you can really create something special. Shockproof rubber pads help minimize vibration which helps maintain practically silent operation. If you’ve even seen the inside of a PC, you know how much dust can pile up. With these fans, you can easily detach the blades for more thorough cleaning when the time comes. One more thing, it comes with a remote control that lets you cycle between different colors, modes, and speeds. For a great fan on a budget, check out the Rosewill RCB Case Fan. This set comes with 2 fans, a remote controls, and a Hub that can support up to 8 compatible fans so you can easily add more to the setup. These high-quality fans have 1200 rpm and are super quiet at only 23.2 dBa, it’s nearly whisper quiet. You get a lot of options for personalization, too, including rainbow, gradient, blade, and breath effects as well as 8 different colors and 4 different brightness levels. That’s not all, you can quickly change all of the settings using only the remote control. Cycle through different colors, change the lighting effect, or increase brightness at the push of a button. One more thing, installation hardware is also included.